I teased a photo of this recipe on Instagram last night, and now here it is. This is seriously coconutty, the flavour boosted by the addition of ground almonds. Warning, if you’re on a low calorie diet, don’t even look at the recipe. Really, you’re still scrolling down? In a medium sized saucepan, add all the ingredients, except the fresh coconut. Stir thoroughly. Cook over a low heat, stirring occasionally for about 45 mins, or until the rice is soft, but still with a slight ‘bite’. There should be very little liquid left. Allow to cool for a few minutes before serving. If you prefer, you can grate fresh coconut over the rice pudding. You could also use toasted desiccated coconut as a garnish. The pudding can be eaten on it’s own, either hot or cold, or can be used as a base for fruit sauces. I will post another recipe, featuring rhubarb, which will go well with the coconut pudding. Let me know if you try this recipe, and please comment and like if you enjoyed this post. It has been a while since I posted a recipe. This is an adaption of a Jamie Oliver recipe, I managed to make 2 large tarts, each enough to serve 6-8 people, or 4 hungry ‘me’s. Cook the potatoes in a large pot of salted boiling water for 15 minutes. Par-cook the asparagus over the boiling potatoes, in a steamer for 4 minutes. Afterwards, remove the asparagus and place in a bowl of cold water. This will help the asparagus retain their bright green colour. Layer the sheets of filo pastry in a large, ovenproof dish, brushing each layer with plenty of melted butter. Reserve a little butter for later. Ensure there is an over hang of pastry of about 2.5cm. Work quickly with the pastry so it doesn’t dry out. Covering the pastry with a slightly damp teacloth may help, whilst you prepare the ovenproof dish. Mash the cooked potatoes with the 2 cheeses, while they are still warm. In a separate bowl, lightly whip together the eggs and cream. Add to the cheese potato mix. Add the nutmeg and onion, season well with pepper and stir to form a batter. Pour the batter over the filo pastry. Bring up the sides of the filo and scrunch them together to form a rim. Drain the asparagus and line them up across the batter. Brush all over the top of the tart with the remaining melted butter. Place into the oven and bake for about 30 minutes, until the top is golden and the batter has just set. Allow to rest for 10 minutes. Serve with salad and/or a crusty mini baguette. If you try this recipe, please let me know how it turned out. Don’t forget to like, comment and subscribe to Champagne Twist. Yesterday I posted a review about the Geffrye Museum, mainly concentrating on the gardens, which are a must see. Today, I’m reviewing the cafe. Like the museum gardens, I was initially rather impressed with the cafe. It has a relaxed, spacious atmosphere, plenty of seating and welcoming to young and old alike. I ordered a lemon and poppy seed cake and English Breakfast tea. Unfortunately as it was late in the day, the lemon and poppy seed cake had to be substituted for a chocolate cake. How I do so suffer for my art. Now, here’s the slight grumble I have – the cake wasn’t presented, I feel, as well as it could. It would have been nice if the cake was served standing on it’s bottom, as pictured above, rather than on it’s side. It’s not a big deal, but a little effort in presentation does go a long way. Also of concern, it was obvious that the cake had not been cut with a clean knife, as evidenced by the crumbs of another cake appearing on the top of my slice. In itself it’s not a big deal, but it does bring questions to my mind about possible cross contamination. I don’t want doubts like that to enter my head, when I’m about to indulge in the task of eating chocolate cake. The strawberry decoration looked a little stale and didn’t taste all that fresh or flavoursome. The cake was a little dry at the bottom. It had a fairly good chocolate flavour, but nothing to write home about. There was also a few stains on the outside of the milk jug, which was disappointing to see. But, I have to say, the tea tasted nice and was piping hot, and I was given a generous quantity of milk. So that’s three up on the William Morris Museum Cafe. However, another more serious faux pas, came to light when I received the bill. The cake turned out to be a Guinness chocolate cake – not that I could taste any Guinness. Fortunately, I’m not an alcoholic, or have allergies to alcohol. I’m sure that any alcohol got up and left the building as soon as the cake was placed in the oven. However, as far as I recall, there was no mention of alcohol as an ingredient, of this standard looking chocolate cake. After the recent conviction of a restauranteur for the manslaughter of a customer, who had an allergic reaction to a takeaway meal, I think it would be wise for the cafe to review the menu and train their staff accordingly. For the grand total of £6.50 (Tea £2.75, Cake £3.75), price wise it’s not too bad – the price of the cake a little steep, but can’t fault the tea. The service was good, if a little slow, considering there were not many customers at the time, and I had a lovely view of the gardens. More positives than negatives, but with a few tweeks, this could be a top notch eatery. Great for tea lovers, but maybe not for cakes lovers. A macaron (/ˌmɑːkəˈrɒn/ mah-kə-rohn; French pronunciation: [makaʁɔ̃]) is a French sweet meringue-based confection made with egg white, icing sugar, granulated sugar, almond powder or ground almond, and food colouring. The macaron is commonly filled with ganache, buttercream or jam filling sandwiched between two cookies. The name is derived from the Italian word macarone, maccaroneor maccherone, the meringue. Why the definition intro? Because I think Ladurée need to read it. I admit I have been extremely late to the macaron bandwagon, as I favour the much more robust macaroons. But, having heard so much of the craze, I decided at long last to take the macaron plunge. I selected a set box of 8, and spent time deliberating over the large range of flavours. I ventured home, taking great care of the precious contents of my thin, green cardboard cartoon. Sadly, one of the macarons, despite my best efforts was damaged. I think the cartoon provided was too big, easily having enough room for 9 or 10 macarons rather than 8. Macarons, are delicate in nature and so I’m rather surprised that this was not considered when designing the packaging. With colourful 8 macarons to try, I invited my friend Lee to pop round for tea and a macaron taste test. A self confessed connoisseur of fine foods, Lee was more than happy to indulge. Of the 8, top score went to the chocolate macaron, gaining a combined score of 7 out of 10. The worse macaron, in a disappointing mix of pretty below average tasting ones, was the green apple favour, receiving a combined score of zero. In my opinion the green apple macaron is so vile, it should be considered an instrument of culinary torture. With little change from £15 for 8 macarons, from an establishment that is said to specialise in such ‘treats’, I expected so much more. One passable chocolate macaron does not make up for the rest, which ranged from interesting, but not worth nearly £2, to downright disgusting. I could have made a lovely cake with £15 worth of quality ingredients. The cake would easily feed at least 6 people, so it makes me wonder why these macarons are considered so ‘en vogue’. These macarons may be pretty to look at, but that was mostly at the cost of flavour – at one point the cardboard box they came in looked more appetising. Overall score: 1 out of 10, and that’s only because of the nice packaging, and the macarons provided some interesting food photography shots! Sorry Lee, I owe you a cake. Bardens is a lovely venue, situated on Stoke Newington Road in Dalston. It has a spacious yet cost atmosphere which is very welcoming. I popped into Barden’s on the way to a local arts and crafts market for a cup of tea. Sadly, it became obvious that tea is not this establishment’s forte – the amount of milk which accompanied the tea pot was minimal, and the tea itself was not as piping hot or as flavourful as it could have been. That said, the service was excellent – it was efficient, prompt and polite. I would love to return for a meal, as the venue was beautifully presented, relaxing and friendly. I particularly like look of the comfy chairs in the front, which reminded me of the furniture in the Central Perk cafe in Friends. Just a pity about the tea. It’s Maundy Thursday today, the day before Good Friday. This year is going by fast, just think it will be April next week. The weather is still cold, so before we enjoy all those chocolate Easter eggs, perhaps we can indulge in something with includes a healthy combination of fruit and nuts … ahem! Preheat the oven Gas mark 4/350 F.
Prep 8 mini loaf tins, greasing well with the vegetable oil. In a large bowl, mix all the dry ingredients together and then set aside. In a jug or small bowl, mix all the wet ingredients together. Pour the wet ingredients to the dry ingredients and fold together until just mixed. Divide the batter evenly between the loaf tins, and bake in the oven for 40 mins, until well risen and golden brown on top. Test with a skewer to ensure the loaves are fully baked. If the skewer doesn’t come out clean, bake for another 5 -10 minutes. If the skewer comes out clean, remove the loaves from the oven and allow to cool in the tin for 5-10 minutes. Then remove the loaves from the tins and continue to cool on a wire rack. Simply combine all the ingredients together and pour equal amounts over the mini loaves, while they are still warm. Leave for a few minutes before enjoying with a nice cup of tea. It has been a busy week here at Champers Towers – my aim to get healthier in 2016 is going well, and to prove it here is a really healthy alternative to the traditional coleslaw, apple and celeriac salad. Cut the celeriac and apple into thin julienne strips. Place in a bowl with the sliced cucumber and chives. In a separate dish, combine the oil, mustard and lemon juice. Stir the dressing in with the celeriac and apple mix. Chill for at least 30 minutes before sprinkling with pumpkin seeds, then serve. Serve as you would coleslaw, or eat on it’s own with a slice of bread. Try my Bajan Beer Bread recipe, it’s quick to make and yummy! Let me know if you try this recipe, I would love to hear how you made it. In between sewing projects, I have been baking up a storm. On Thursday I made mini coconut loaves (recipe posted on tomorrow), and yesterday I made these mini Bajan beer bread loaves. I am creating a series of recipes using coconut oil as one of the ingredients. I also happened to have a bottle of Barbadian Beer in the cupboard, as you do. 4 ingredients, all with a link to Barbados, hence the name Bajan Beer Bread. That and I like the alliteration. Quick to make, and only 4 ingredients, you can whip these up and serve them in time for lunch. Grease and line 8 mini loaf tins, then set aside. In a large mixing bowl, sieve in the flour and sugar. Pour over the beer flour mix and stir quickly and thoroughly. Spoon the batter into each tin. 2 full dessert spoons per tin should suffice. Dab a little coconut oil on top of each of the loaves to self glaze. You can brush the top of the loaves with melted coconut, for a more even glaze if you prefer. Put the mini loaf tins onto a baking sheet and place on the top shelf of the oven. Bake for about 45-55 mins, until the top of the loaves are golden brown. The bottom of each loaf should make a hollow sound then tapped. You can enjoy these mini loaves with cheese, as part of a ploughman’s lunch or on their own with a little coconut oil. I shall be making another version of this bread soon, so stay tuned. What do you think about this recipe? If you try it, please let me know how it went, I would love to hear from you. Don’t forget to look in tomorrow for the mini Coconut loaf recipe and please like, subscribe and comment in the box below. Another food review for you to digest! 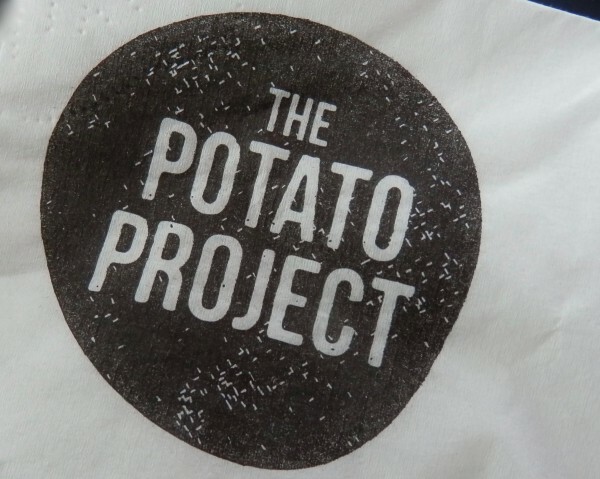 A small group of us searching for a healthy snack on our way home from shopping, discovered the new eatery The Potato Project. Based in Soho, the cafe and take-away on Noel Street, boasts a menu of tempting baked potatoes, with far from usual toppings. With sweet potatoes also available as an alternative to the humble spud, it makes a change from deep fried chips and calorie laden pizza slices usually on offer, after a full day’s gallery visiting and shopping. Not wanting a huge meal, I plumped for Spicy Wedges, Sour Cream & Crispy Onion for a very reasonable £3.50. I also tried an orange drink, which I will review in a separate post. The range of drinks was impressive as were the prices charged. The total cost of was the princely sum of just £5. While the cafe is well laid out, the staff kind, friendly and helpful and the general atmosphere welcoming, there are a couple of issues I have with this cafe. It is very small, and while the owners have made the most of the available space, it was difficult for the group to eat our meals with comfort on the tiny tables. It would be near impossible for people with mobility difficulties to move around the cafe. It’s difficult to imagine how a small group of friends could pack themselves in during the busy lunchtime rush – with the minimum of baggage, let alone loads of shopping. The main problem I have however, was that the wedges I had were over cooked. The mixed spices used were lovely, the sour cream and crispy onion delicious, but the wedges themselves were burnt, leaving an acrid after taste. A pity, because apart from that, everything else was pretty much perfect. My friends had baked potatoes and the toppings looked and from their accounts, tasted great. I suppose I was just unlucky with my choice. To be fair, we rocked up about 40 minutes before closing time and it was clear that we were consuming the last of the day’s stock. Service was quick and efficient and this new eatery on paper, has all the makings of a success. The prices are reasonable and the menu exciting, but food quality control needs addressing, especially at the end of the day. With reluctance, I can’t give The Potato Project the high rating I wish I could, but I continue to have high hopes for the future for this eatery, because the concept is simply brilliant. The first half of February has gone, and it’s time for me to take a serious look at my diet. I love flour, in whatever form it may take, be it cakes, breads or pastries. But, as we know, it’s a no-no on the carb register. So in an attempt to modify my diet to a healthy one, I am substituting white, processed flour with wholemeal or spelt flour. Here’s a simple recipe for wholemeal pastry which can be frozen ahead for the joys of pies, flans and tarts later. Sieve together the flour and salt if using, into a large bowl. Cut the butter into small cubes and add to the flour. Gently combine the flour and butter, rubbing the mix in between your fingers tips, until it resembles fine bread crumbs. Add the water a table spoon at a time,and combine until the mix forms a rough dough. Don’t worry if you don’t use all the water. So long as you can form a moist dough, that should be enough. If you find the mixture too dry, try adding another tablespoon of water. If the dough become too wet, just add a little more flour. Knead gently for about 2 minutes, until the pastry forms a smooth dough. Place in a freezer bag and freeze immediately, or if using straight away, allow to rest in the fridge for about 30 minutes. I often substitute the salt for celery salt or finely chopped herbs, to help keep my salt intake in check. I also roll out the pastry as thin as possible, so that it’s enough for 3 or 4 pie cases. That way I’m not over loading with carbs. Let me know if this recipe works for you in the comments below.